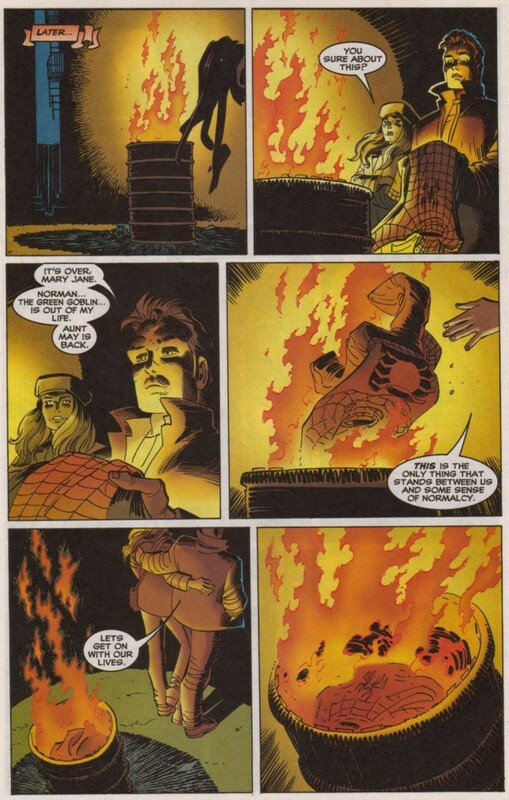 For all the debate that’s been had about how Dan Slott is wrapping up his most ambitious story arc ever in the Superior Spider-Man, today’s final issue would have to be so incredibly dreadful for it to even approach the awfulness that was put forward when Marvel ended its first “volume” of Spider-Man comics in 1998. “The Final Chapter” has to be a part of the discussion for worst Spider-Man storylines ever. 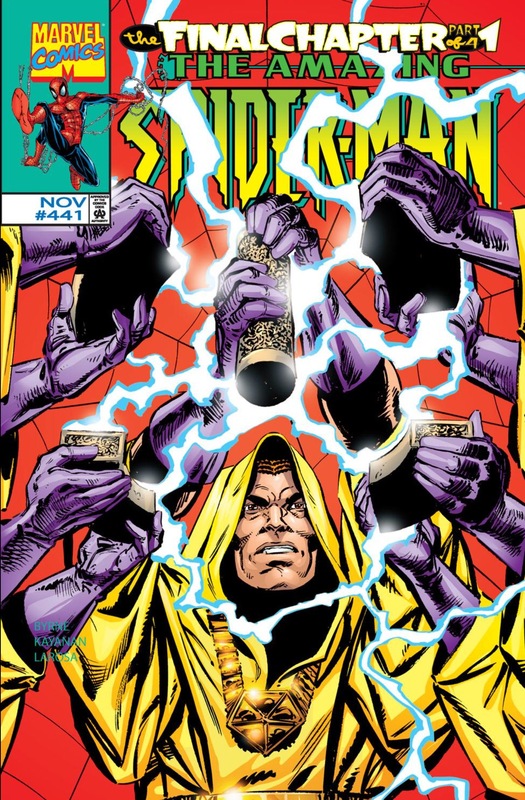 For all the hate the “Clone Saga” gets, I don’t think it’s half as bad as “The Final Chapter,” which ran across four issues (Amazing Spider-Man #441, Spectacular Spider-Man #263 and Peter Parker Spider-Man #97-98) and featured a host of terrible ideas that were posited as an “end of an era” for Spidey comics. Before I go too much further in bad-mouthing a story that was created more than 15 years ago, I do want to mention that as a habit, I try to avoid putting a spotlight on those truly “bad” Spider-Man storylines from yesteryear (I’ve made a few exceptions). For one, every time I write about a Spider-Man comic, new or old, I go out of my way to read or re-read those issues. So why would I want to put myself through the pain of doing that unless there is a legitimate reason? Additionally, I like to think of Chasing Amazing as a celebration of Spider-Man comics. Yes, I can’t possibly like everything that’s ever been published with Spider-Man’s name on it, but I started this blog because I love Spider-Man, love collecting his comics, and want to reflect on the stories and issues that have personal significance to me and have helped shaped my fandom. But given that we are on the cusp of a “volume three” of Spider-Man comics, I do think it is appropriate to look back at “The Final Chapter,” in large part as a reminder of how low things once were in the world of Spidey and how far they’ve come since then. I’m sure some of you out there are going to bring up “One More Day” as the true nadir of Spider-Man, but at least that turd of a storyline was followed up with “Brand New Day,” which despite its dramatic status quo shift, produced some truly wonderful Spidey books over the span of nearly 100 issues. “The Final Chapter” happened, and rather than seeing the Spider-Man franchise pull out of its death spiral, fans were treated to infamous Howard Mackie/John Byrne reboot. 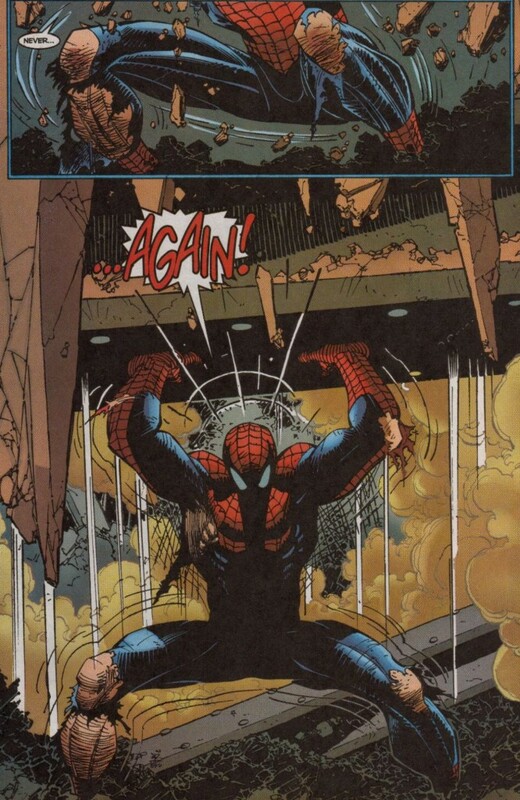 If it wasn’t for J. Michael Straczynski and John Romita Jr. jumping aboard in 2001, who knows what the world of Spider-Man comics would have looked like today. 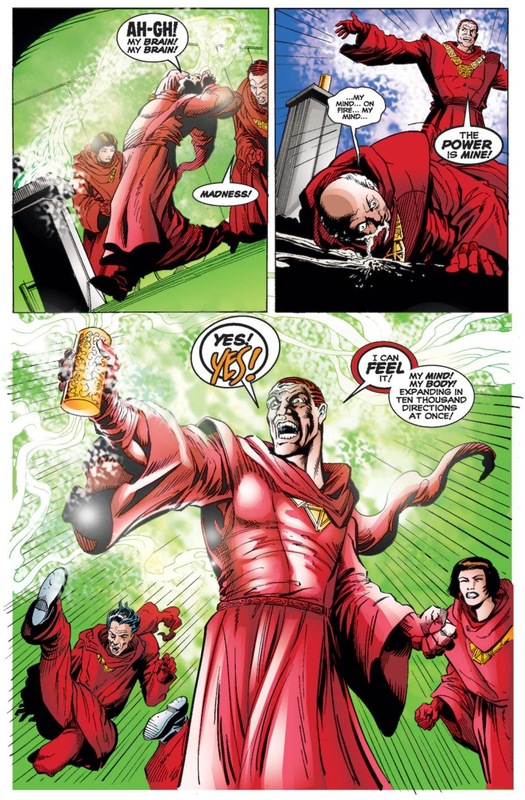 For the uninitiated (and I even hinted that “Final Chapter” might show up on Chasing Amazing during the most recent episode of Superior Spider-Talk), this storyline focuses on Norman Osborn and a crew of other mystical people from the Marvel Universe (including Madame Web) carry out a ritual that grants each participant one of five gifts: immortality, wisdom, power, madness and death. Norman naturally wants “power” to be his gift, and he thinks he’s received it, but nope, it’s actually madness, creating one of many awkward and poorly conceived plot points and reveals in this storyline. Still, I’m burying the lede as to why this story is such a horror show. 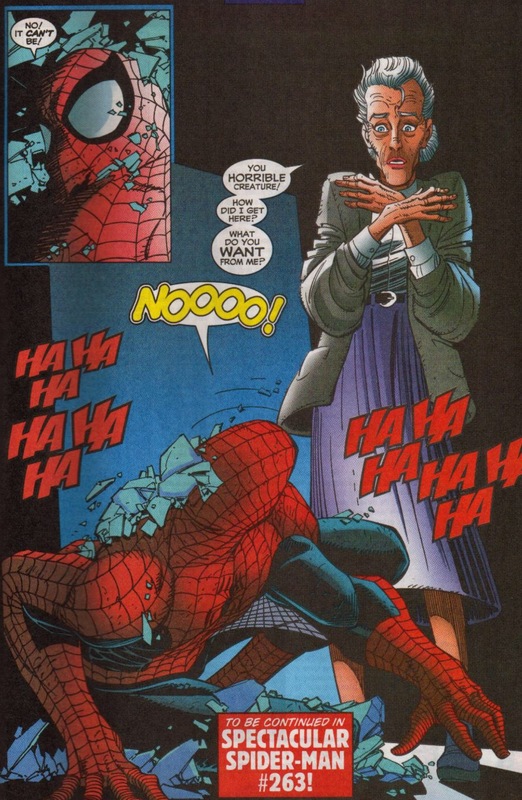 The biggest contribution “The Final Chapter” provides to the world of Spider-Man is that it resurrects Peter’s Aunt May only a few years after J.M. DeMatteis and Mark Bagley crafted one of the finest, tear-inducing character deaths in comic book history. But that’s not the worst part. 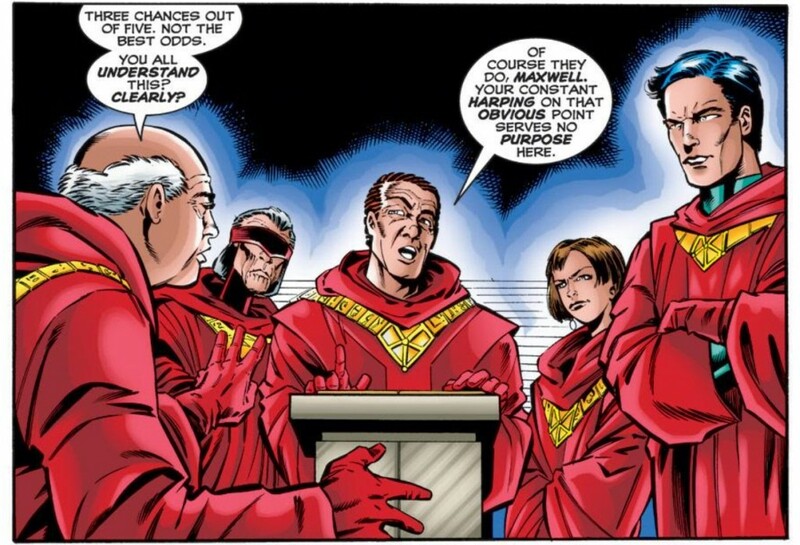 As much as it was an insult – period – to resurrect a character that was given such beautiful closure only a few years earlier, Mackie (who wrote three of the four issues of this arc) really finds a way to outdo himself by explaining away May’s “death” in the most convoluted, incredulity-straining way possible. You see, that version of May who died in ASM #400? That wasn’t actually May. That was an actress Norman hired to play May, while he kidnapped/held hostage the real one. Norman injected this actress with May’s “genetic matrix” (I like to laugh at how often that phrase shows up in this story, as if saying it over and over makes it sound any more plausible), trained her to act and sound like the real May, and even told her Peter’s secret identity, so when she eventually died, the whole thing would have been some psychological mind-bleep for our web slinging hero. Still with me? Great … so when Spidey discovers May, Norman also reveals that he has placed a “genetic bomb” in her brain, that would detonate and melt the DNA of everyone in the vicinity. There’s a reason I didn’t read much Marvel in the late 90s. And whenever I find myself looking back at these issues, I feel validated by my decision to use what little money I had during this period towards maintaing some semblance of a teenaged social life rather than hitting the local comic book shop once a week to buy something I would be embarrassed to say I owned. By the way, I totally didn’t even mention that the impetus for the May discovery was that Norman tricked Peter into believing he was holding his infant daughter May hostage (who Norman kidnapped and in all likelihood killed during the “Revelations” arc). So yeah for Marvel – infanticide is AOK, but Aunt May is untouchable! Now that I’ve gotten that rant off my chest, let me wade through the rest of this storylines ridiculous. A lot of that truly terrible stuff comes courtesy of the final two issues (or more accurately, the last few pages of Spectacular #263 and the entirety of Spider-Man #98. 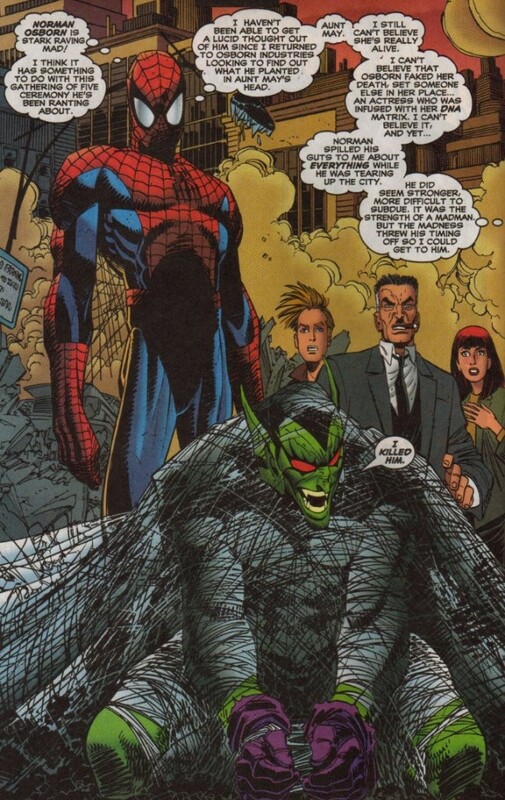 At the end of Spectacular #263, it appears that the Green Goblin has FINALLY succeeded in killing Spider-Man. He has the hero on the ropes, knocks him out and then wallops him with a pumpkin bomb. 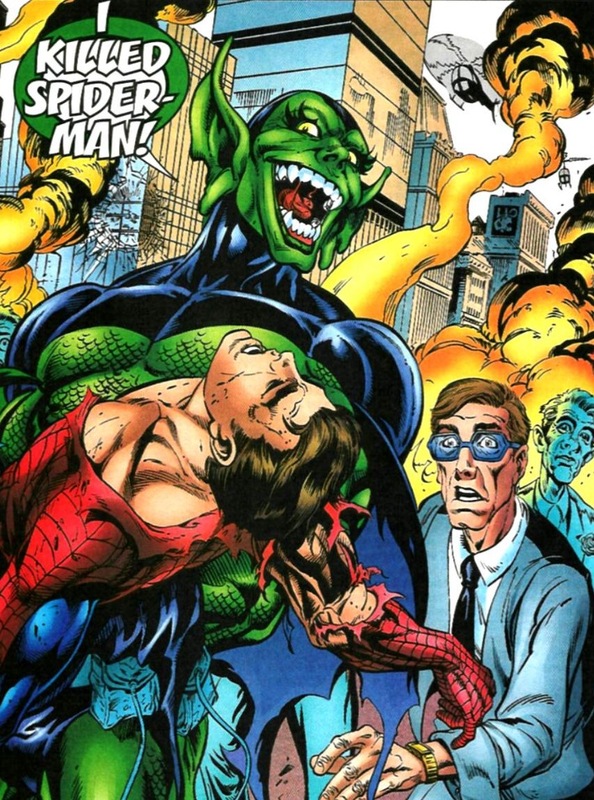 The comic ends with Green Goblin celebrating Spidey’s death. Then, the very first page of Spider-Man #98 reveals that the whole thing was in Norman’s head. Instead, the Goblin is webbed up and that “power” he thought he had acquired during the “Gathering of Five” ritual was actually madness. Talk about your bait and switches. Not that I would root for Spidey to die, but that’s such a cheap stunt by the creative team. At least try and build the drama a bit more and let the reader become invested in the idea that the Goblin succeeded. I understand that these comics were released within weeks of each other, and I’m talking about reading this in a more instant collected format, but I have to think I’d still be pretty cheesed off if I waited for Spider-Man #98, and when I opened it up Mackie more or less told me that everything that happened last issue didn’t actually happen. Then there’s the way Mackie and Co. go about trying to establish a new status quo. Remember, Marvel was just about to reboot its entire line of Spider-Man comics, consolidating multiple series into two main books: Amazing Spider-Man and Peter Parker Spider-Man. 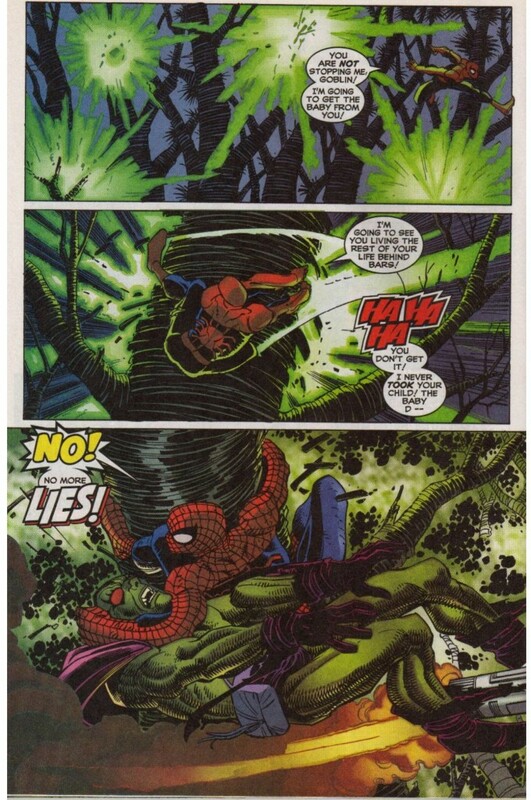 Providing some kind of closure on the long-running Spider-Man/Green Goblin feud, which had been simmering since the character first returned from the dead a few years earlier, apparently wasn’t enough of a “bang” to end the first volume of Spidey. So, instead readers got an out of left field story where Osborn’s pumpkin bomb blows up the Daily Bugle building, and everyone (including good old J. Jonah Jameson) decide it’s all Spidey’s fault. I know Spidey had been portrayed as a “menace” for years, and having the public doubt and distrust him is all part of the game – but there’s something so utterly incoherent about the fact that the creators decided to go down this route AGAIN, especially when John Romita Jr., gives us some very striking visuals of Spidey sacrificing himself by holding up the foundation of the Bugle building (a la “If This Be My Destiny”). If ever there was a time for Jonah to back off the crusade, this was it, and yet Mackie thought differently. The net result is that Spider-Man “quits” the crime fighting business “for good” this time, tossing his suit into a dumpster. I thought the “Spider-Man No More” story was worthwhile the first dozen times Marvel did it, but sure, let’s just do it again. Who cares that such a significant moment warrants its own dedicated issue of content so that its impact can fully resonate? Let’s just attach this emotional beat with a rivet gun on the final few pages of this comic, leaving a random cliffhanger at the end of a series that was allegedly supposed to provide closure (hence, “The Final Chapter”). P.S., Peter was back as Spider-Man two issues into the Mackie/Byrne reboot. As just a final quibble about how “The Final Chapter” was presented, something that has long bothered me was how this arc was sequentially published. Call me a traditionalist, but Amazing Spider-Man is, and will always be, the flagship Spidey title. As such, the first volume of Spider-Man should have been ended within the pages of ASM and not in the adjective-less Spider-Man series. That just smacks of Marvel being tone deaf and oblivious to its own history. Additionally, why end this series on such a random number like #441? Say what you will about the contents of ASM #700, but ending the series on such a big and important number gives the moment true gravitas. I guess Marvel was just totally desperate to rebrand its books (the late 90s were such a turbulent time for them), but couldn’t they have found a way to stretch this series out to #450 before hitting the reset button? Obviously, mistakes were made, and outside of the fact that Aunt May is still alive and well, “The Final Chapter” hasn’t figured into the main Spider-Man storyline in years. I guess that should make me feel better about things, but as you can tell from the tone of this post, it hasn’t. The fact is, I’m a huge Spider-Man fan, but a big part that comes with being a loyal reader is understanding that there will be periods where my loyalty is going to be taken for granted by Marvel’s editorial department. The sad thing is, JM DeMatteis had been building up so much great drama and tension with Osborn’s presence in Spec. Spidey, and to have it all come to…this…was just insult to injury. Rereading this story (with the aid of painkillers, naturally), what becomes apparent is how much of this “Final” story is really just going through the motions to get the story to the reboot status quo. There’s no sense of tension, or building suspense, or any techniques used in an actual finale. It’s just moving the pieces into place as quickly as possible. But what REALLY confounds me, and always has, about the reboot immediately following the story, is how much of the story in the new Amazing and Peter Parker titles immediately relate back to this storyline. Even in the sense of internal storytelling, the actual renumbering of titles is just an arbitrary distinction. Juxtapose this to Superior Spidey where, even though Slott would bring in plot threads from earlier in his Spidey run, there was a clear narrative break from Amazing, not limited to the new protagonist. SpOck got his own conflicts for the first several issues, prior to the older plot points bubbling back to the surface. The reader got to appreciate the new status quo before addressing baggage left by the old. Despite all of the objectively terrible stuff coming out of the 90’s reboot, though, my biggest gripe with it, (and what got me to stop reading for several years) was how astoundingly uninteresting it all was. Bad is one sin, but boring is far worse from an entertainment medium. Great article Mark, even though it brings back terrible memories for me! After reading Spider-Man very consistently since 1982, this story line, and specifically Aunt May coming back, was the absolute CLOSEST I ever came to dropping the book for good. It was only the interest that I had in John Byrne’s art that got me coming back around two months later for Amazing (vol 2) #1!